Start your journey with Springwell Running Club! you have company and it makes running a lot more easier. if you want to improve you can be given tips, do structured training sessions and be encouraged to run faster by those who have experience. you are motivated to go out for a run because you are with other people. you will make a new group of friends who understand all the joys and problems of being a runner! racing becomes a much more enjoyable experience as part of a club with your clubmates there to support and encourage you. You will find that our club members are very supportive of a new runner and we attempt to cater for all abilities. Springwell currently has 160+ members ranging in age from our hugely enthusiastic juniors to our ever-youthful president, Mr James Reid MBE, a gold medallist in the GB and Ireland cross country championship at the age of 70! Springwell club members take part in running all types of distances from 5km road races to marathons and even ultra-marathons and all different types of running including cross country, mountain races and multi-sport events. If you are interested in joining us, please come along to one of our training sessions or contact one of the club officers through our online form. There is no obligation to join the club until you have been to a few training sessions to see if you like it but if you do wish to join, membership is £20 a year for adults, £15 for students and juniors (under 16) and £55 for family membership. Membership forms are below. You can now also pay your membership online. Fill out your application and email to emer.thompson@btinternet.com. Once you have sent application please make your payment below using the Paypal button and choose the membership you require. 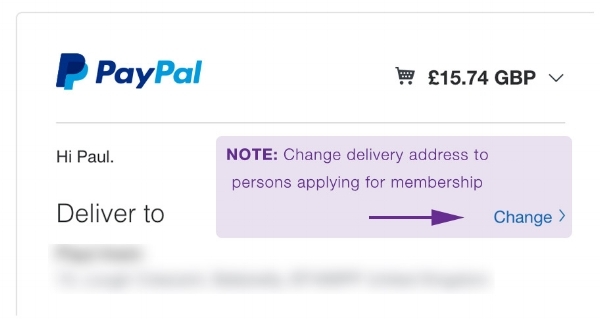 In the Paypal checkout, please make sure the delivery address is changed to reflect the person that the membership application applies to (see diagram below). Please note there is a small additional Paypal charge to pay fees online.